Upper East Side 2BR/2BA Under $800K! 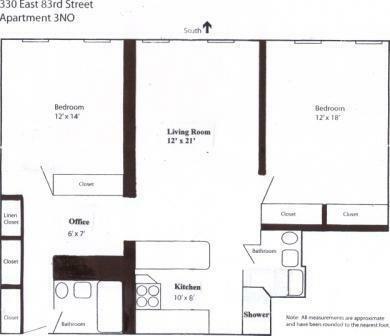 True two bedroom, two bathroom apartment on lovely upper east side street. In addition to 2 full size bedrooms, this apartment has ample closets (as well as basement storage), high ceilings, and even has a great home office area. It's newly renovated kitchen boasts stainless steel appliances, beautiful wood cabinetry and granite counter-tops. Both bathrooms have been fully renovated with beautiful tiles. The master bathroom has a fully operating rain shower. The apartment has exquisite hardwood floors which have all been refinished in the last 4 years. All rooms have new through-the-wall air conditioners. The apartment is located in the back of the building which provides a bright southern exposure and shelters it from the noisy streets. The quiet serene environment makes for a wonderful home. Part time doorman. Sorry, no pets.